Not to be confused with Goose barnacle. The barnacle goose was first classified taxonomically by Johann Matthäus Bechstein in 1803. Branta is a Latinised form of Old Norse Brandgás, "burnt (black) goose" and the specific epithet is from the Ancient Greek leukos "white", and opsis "faced". The barnacle goose and the similar brant goose were previously considered one species, and were formerly believed to spawn from the goose barnacle. This gave rise to the English name of the barnacle goose and the scientific name of the brant. It is sometimes claimed that the word comes from a Celtic word for "limpet", but the sense-history seems to go in the opposite direction. The barnacle myth can be dated back to at least the 12th century. Gerald of Wales claimed to have seen these birds hanging down from pieces of timber, William Turner accepted the theory, and John Gerard claimed to have seen the birds emerging from their shells. The legend persisted until the end of the 18th century. In County Kerry, until relatively recently, Catholics could eat this bird on a Friday because it counted as fish. 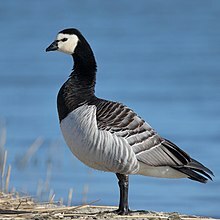 The barnacle goose is a medium-sized goose, 55–70 cm (22–28 in) long, with a wingspan of 130–145 cm (51–57 in) and a body mass of 1.21–2.23 kg (2.7–4.9 lb). It has a white face and black head, neck, and upper breast. Its belly is white. The wings and its back are silver-gray with black-and-white bars that look like they are shining when the light reflects on it. During flight, a V-shaped white rump patch and the silver-gray underwing linings are visible. A new fourth population, derived from the Novaya Zemlya population, has become established since 1975 breeding on the islands and coasts of the Baltic Sea (Estonia, Finland, Denmark, and Sweden), and wintering in the Netherlands. Its population numbers about 8,000. Small numbers of feral birds, derived from escapes from zoo collections, also breed in other Northern European countries. Occasionally, a wild bird will appear in the Northeastern United States or Canada, but care must be taken to separate out wild birds from escaped individuals, as barnacle geese are popular waterfowl with collectors. Barnacle geese frequently build their nests high on mountain cliffs, away from predators (primarily Arctic foxes and polar bears), but also away from food. Like all geese, the goslings are not fed by the adults. Instead of bringing food to the newly hatched goslings, the goslings are brought to the ground. Unable to fly, the three-day-old goslings jump off the cliff and fall; their small size, feathery down, and very light weight helps to protect some of them from serious injury when they hit the rocks below, but many die from the impact. Arctic foxes are attracted by the noise made by the parent geese during this time, and capture many dead or injured goslings. The foxes also stalk the young as they are led by the parents to wetland feeding areas. The barnacle goose is one of the species to which the Agreement on the Conservation of African-Eurasian Migratory Waterbirds applies. According to Sveriges ornitologiska förening, the geese began breeding in Sweden in 1971, and according to Skansen, it was 40 years ago, more or less, when the entire population of barnacle geese left in the autumn to return in spring, soon after they began breeding in the wild. The number of barnacle geese is stable to increasing. Nature produces [Bernacae] against Nature in the most extraordinary way. They are like marsh geese but somewhat smaller. They are produced from fir timber tossed along the sea, and are at first like gum. Afterwards they hang down by their beaks as if they were a seaweed attached to the timber, and are surrounded by shells in order to grow more freely. Having thus in process of time been clothed with a strong coat of feathers, they either fall into the water or fly freely away into the air. They derived their food and growth from the sap of the wood or from the sea, by a secret and most wonderful process of alimentation. I have frequently seen, with my own eyes, more than a thousand of these small bodies of birds, hanging down on the sea-shore from one piece of timber, enclosed in their shells, and already formed. They do not breed and lay eggs like other birds, nor do they ever hatch any eggs, nor do they seem to build nests in any corner of the earth. This belief may be related to the fact that these geese were never seen in summer, when they were supposedly developing underwater (they were actually breeding in remote Arctic regions) in the form of barnacles—which came to have the name "barnacle" because of this legend. ...Bishops and religious men (viri religiosi) in some parts of Ireland do not scruple to dine off these birds at the time of fasting, because they are not flesh nor born of flesh... But in so doing they are led into sin. For if anyone were to eat of the leg of our first parent (Adam) although he was not born of flesh, that person could not be adjudged innocent of eating meat. The question of the nature of barnacle geese also came up as a matter of Jewish dietary law in the Halakha, and Rabbeinu Tam (1100–71) determined that they were kosher (even if born of trees) and should be slaughtered following the normal prescriptions for birds. The mythical barnacle tree, believed in the Middle Ages to have barnacles that opened to reveal geese, may have a similar origin to the other legends already mentioned. ^ BirdLife International (2012). "Branta leucopsis". IUCN Red List of Threatened Species. Version 2013.2. International Union for Conservation of Nature. Retrieved 26 November 2013. ^ a b Jobling, James A (2010). The Helm Dictionary of Scientific Bird Names. London: Christopher Helm. pp. 77, 225. ISBN 978-1-4081-2501-4. ^ Soothill, Eric; Whitehead, Peter (1978). Wildfowl of the World. London: Peerage Books. ISBN 0-907408-38-9. ^ Ekin, U. (2011). "Branta leucopsis barnacle goose". Animal Diversity Web. University of Michigan Museum of Zoology. Retrieved 8 January 2015. ^ "Waterbird species to which the Agreement applies". UNEP/AEWA (United Nations Environment Programme/African-Eurasian Waterbird Agreement). Retrieved 8 January 2015. ^ "These Birds Are Racing to Their Mating Grounds. It's Exhausting". Retrieved 20 July 2018. ^ Lankester, Edwin Ray (1970) . Diversions of a Naturalist. p. 119. ISBN 0-8369-1471-6. ^ "Barnacle Goose". The Medieval Bestiary. Retrieved 10 December 2016. Wikimedia Commons has media related to Branta leucopsis. "Barnacle goose media". Internet Bird Collection. Audio recordings of Barnacle goose on Xeno-canto. This page was last edited on 18 November 2018, at 04:24 (UTC).